Closest Focusing Distance:150cm / 59.1 in. ・Incorporating Sigma's original OS (Optical Stabilizer) function. ・Three SLD glass elements and a rear focus system provide optimum image quality throughout the entire zoom range. ・Super multi-layer coating reduces flare and ghosting. ・The minimum focusing distance of 150cm (59.1'') makes it useful for close-up photography. ・HSM ensures quiet and high-speed autofocus. ・Compatible with Sigma's APO Tele Converters. 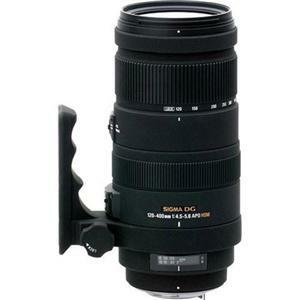 This telephoto zoom lens incorporates Sigma's original OS (Optical Stabilizer) function. It offers the use of shutter speeds approximately 4 stops slower. Three SLD (Special Low Dispersion) glass elements provide excellent correction for chromatic aberration. This lens is equipped with the rear focus system that minimizes fluctuation of aberration caused by focusing. It provides optimum image quality throughout the entire zoom range. The super multi-layer coating reduces flare and ghosting. High image quality is assured throughout the entire zoom range. The minimum focusing distance of 150cm (59.1'') throughout the entire zoomrange and has a maximum magnification of 1:4.2 make it useful for close-up photography. This lens incorporates HSM (Hyper Sonic Motor) which ensures a quiet and high-speed AF as well as full-time manual focusing capability. The addition of the optical 1.4x EXDG APO or 2x EX DG APO Tele Converters produce a 168-560mm F6.3-8 MF ultra-telephoto zoom lens or a 240-800mm F9-11 MF ultra-telephoto zoom lens respectively.